Nintendo dominated the portable game market for long enough. In 2005, Sony released the PlayStation Portable, after plenty of hype, and it experienced a very good launch. The supplies were not a problem as they were with the PlayStation 2 launch. This is likely because the price started, and has remained, at $250 which is expensive for a portable system. Despite being $100 more than the Nintendo DS, it has been dominating market share in all three markets it is sold in. The PSP's European launch, however, may have been a big success but also a costly one for Sony of Europe, because of the major delays that market faced. Many Europeans imported their PSPs from Japan, and Sony of Europe lost out on revenue for their launch. (The eventual launch would later prove to be still overwhelming for SCEE.) Sony's response to this, however, was not region locking—from day one, the PSP has never prevented play of games from a region other than its own, although it does enforce UMD video regions. Instead Sony sued many import retailers, causing them to stop their business, or in the case of Lik-Sang.com, they fought back and although no news has been released about the matter, Lik-Sang never stopped selling PSPs. The PSP features a 222 MHz processor, which is actually a 333 MHz stock processor that has been underclocked for longer battery life. It has been theorized that since Sony is releasing a higher capacity battery, new games will begin overclocking the CPU to its full power. Current games seem to perform very well at the lower 222 MHz speed. The PSP also has built-in Wi-Fi for wireless gaming and internet access. Since Wi-Fi supports peer-to-peer connections, PSP multiplayer games can be played wirelessly. 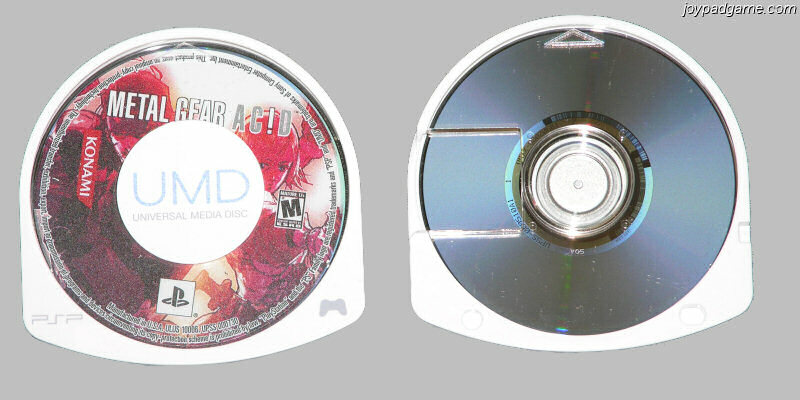 Games use the proprietary UMD format, which is a clamshell hard case containing a mini-DVD type disc inside. The UMDs resemble Sony's MiniDisc format, but they are not recordable and the capacity is much higher. UMDs contain a copy-protection scheme using AES encryption and unique IDs for every game, but even these measures, which Sony probably spent a fortune to implement, have proven worthless at stopping piracy. For a while, eBay was saturated with hundreds of listings of games that were being sold as "only compatible with version 1 and 1.5 firmware with 1GB Memory Stick Duo." Obviously these were ISO images being sold. It is insanely easy to pirate games on the PSP, so Sony has obviously wasted their efforts trying to encrypt UMDs. As for the unique identifier, Sony can never know who bought the ripped game unless it requires every UMD sale to be registered on the spot, which would be a bad customer experience. Nor can it block the game from running unless the user updates his firmware to a post-rip firmware (which pirates won't do, since the UMD loader would not run on that firmware anyway). I am of the belief that spending a lot of money on copy protection is a waste of money. If Sony put that money into making every game $5 cheaper, and I don't doubt for a moment that they spend about as much on copy protection schemes, they might have much better sales. The PSP has a wide array of features, and most of them are too ordinary and easy to access to be designated as Neat Tricks. From initial release, the PSP has supported UMD video, a UMD that contains a feature-length film, but usually not all the features of the DVD. Many have argued that the UMD video format is useless, because the $20 videos (generally, UMDs are the same price as DVDs) can only be played on the PSP. In addition, one could trivially rip a DVD and convert it to a PSP video format, then copy it over to a large Memory Stick Duo. This would also eliminate any region issues. Despite this, Sony predicts higher UMD video sales than game sales! It remains to be seen whether that comes true. One issue perhaps is that few people understand how to rip a DVD and put it on PSP. You can find out how in Neat Tricks. The PSP is also the first system Sony has released to come with a standard storage device that uses a regular FAT file system, the Memory Stick Duo. These cards are readily available and very small. The capacity can go as high as 2GB. By connecting the PSP to a computer USB port, one could put their music and movies on the PSP and watch them from the PSP main menu. The PSP plays MP3s and video files, and also has a photo browsing feature. Those features have been around since release. Only MP4 video files can be played, and PSP Video 9 converts to this format. Users of firmware version 2.0 have a new feature - web browsing. The PSP web browser works pretty well, and it connects to any wireless access point for internet access. It is possible to crack the web browser some games use for game home pages and thus use a web browser in earlier firmware versions. This usually involves changing the DNS server to one that lies about the server for the PSP game's homepage, and directs you to a URL entry field. Earlier firmware lacks a lot of symbols you need to type URLs, though, so be sure to add favorite sites to the list from a PC. A portal you can use to access the browser like this is RidingTheClutch.com. The selection of games for the PSP reflects its heritage as a Sony system. Most of the games that have come out are sports and racing games, with a few platformers. These type of games are uncommon on the Nintendo DS, and likewise the variety of games that are avilable for the DS that make use of the stylus are not seen on the PSP. In a way the PSP is just a do-over of the first PlayStation. However, its power is compared often with the PS2, and Sony claims to be porting, actually converting from PS2, their hit racer Gran Turismo 4. Neat Tricks The PSP has so many Neat Tricks, there are people who buy the system just to take advantage of them. The PSP is an amazing "tech toy" even with only stock features, but the possibilities are endless when you factor in homebrew and modding. The PSP is truly a small computer with a 333MHz processor, and that is its only real limit. Although information is sketchy, people have demonstrated that they can install Linux, Windows 95, and Mac OS 8 on a PSP and use them! I will start small, since most people do not want to bother with homebrew and modding. But a lot of people want to know how to rip their DVDs and play them on the PSP. It is really simple to do, and requires a couple of free programs and a large enough Memory Stick Duo. First, you need to rip the DVD to AVI format. For this I use freeware CladDVD, which is a very easy program to set up because it does not require the separate installation of a decoder plug-in. Everything needed to rip a DVD is included. Once your DVD is converted to AVI format (it might still have the extension .VOB), you can convert it to MP4 using PSP Video 9. PSP Video 9 can then copy the movie directly onto your PSP. One problem I had was that PSP Video 9 will automatically convert your DVD to the aspect ratio of your PSP screen, which causes distortion for a 4:3 movie or TV show. To solve this problem, it is necessary to change the settings to a resolution with the correct aspect ratio. If you record in a 4:3 aspect ratio, you can stretch the picture to fit the screen from the PSP video player. However, if you let PSP Video 9 convert to the PSP resolution, you're stuck with it. Convert wisely. Enough of the DVD talk, now to discuss the features of homebrew! Important: Homebrew EBOOT files will only execute on version 1.0 or 1.5 firmware. However, there are exploits in progress for all firmware versions. Currently, there is a great loader by Fanjita that can be executed on firmware 2.0 that loads most homebrew through the TIF overflow exploit. With the Fanjita loader, it is no longer necessary to use the rename exploit for 1.5. There's no working EBOOT loader for any firmware over 2.0, and since nothing yet requires a higher firmware version than 2.0, do not upgrade! Having said that, there is already a great Grand Theft Auto Trainer that runs on 2.0 through 2.6 firmware that executes homebrew code simply by loading it as a GTA savegame. Fanjita claims to be working on an EBOOT loader that executes in the same manner, by loading from GTA. This is a great idea, since unlike firmware, which Sony can modify, the contents of the Grand Theft Auto are pretty firmly locked from updates (of course, much like the Hot Coffee fiasco, they might be able to change future UMDs). Although it hasn't been verified, it is claimed that the GTA method runs in kernel mode, which makes more sophisticated things, up to downgrading, a possibility. This also means that GTA savegame files can be infected with brickers from this point forward, so download them only from trusted sources. All of the tools mentioned above are either found or linked from PSPUpdates.com. Just to name a few of the homebrews I have seen, I have seen countless parlor games (such as Tetris, Breakout, etc. ), text editors, media players, and even a full programming language runtime environment, Lua Player. There are also many great emulators for the PSP. For more information about emulation in general, see the emulation page. There is no modchip for the PSP (nor any need). However, some interesting things have been done inside the PSP. There is a thriving parts community, trading bad LCDs, UMD drives, etc. for good. There are also some projects that have made their way to PSP hack sites. For example, one guy wired his PSP's Wi-Fi antenna to an external antenna for better signal strength. One interesting prospect is the use of the PSP on a TV with an external controller. Believe it or not, someone is even working on this idea. The PSP2TV is a project where, by simple installation of a new faceplate, you can connect a TV and Dual Shock 2 controller to the PSP with no solder. Release date is currently unknown, but Lik-Sang is already taking pre-orders for PSP2TV for $120 with an optimistic release date of Oct. 30. The PSP is a wonderful emulation system, arguably almost as good as a PC. The selection of emulators is great, and compatibility and speed seem to be better than a 333MHz PC. Some important things to note: First of all, run the emulator in 333MHz ("overclocked" mode), and second, use frame-skip to keep the game in sync. Although the game may be a tad choppy, it will run as fast as it should. A large selection of PSP emulators can be found at PSPUpdates.com. Many come with a version that is already set up for 1.5 firmware.